The Nobel laureate and former President of Timor-Leste, Jose Ramos-Horta, will deliver the inaugural Tom Uren AC Lecture on May 7 to commemorate the life of the former Australian politician, prisoner of war and peace activist. Mr Uren, who served as a minister in the Whitlam and Hawke Governments, died on Australia Day, 2015, after an extraordinary life of progressive activism. Labor Party branches in my electorate have established the annual Tom Uren AC Memorial Lecture to build upon Tom’s intellectual legacy and lifelong commitment to peace and justice. Dr Ramos-Horta is the perfect choice to deliver the inaugural address given Tom’s dedicated advocacy for independence for Timor-Leste. In 2013 the Timor-Leste Government awarded Tom the Order of Timor-Leste Medal for his long-standing support for self-determination for the East Timorese people. On the occasion of Tom’s death, the Timor-Leste Government released a statement which described him as “a man of dignity and courage’’. “Tom spoke powerfully many times over the years of struggle about what was happening in Timor-Leste and consistently gave support to Australian activists working in solidarity with the Timorese people,’’ the statement said. 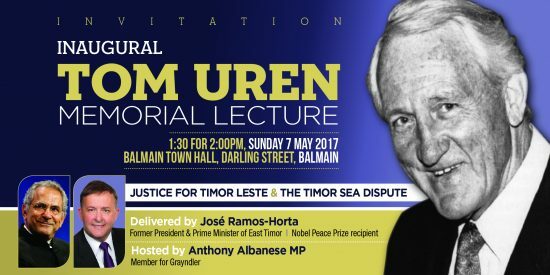 Dr Ramos-Horta will focus this inaugural Tom Uren AC Lecture on justice for Timor-Leste with regard to the disputed gas fields in the Timor Sea. The lecture is being inaugurated with the active involvement of Tom’s family. It will take place at the Balmain Town Hall, in the suburb where Tom was raised and lived his final years.